Even if your shade of green is pretty deep, plastic is so ubiquitous that it’s likely you still have more than you’d like in your life. Whether it’s tupperware, water bottles, cling wrap, baggies, or produce bags, most of us still get more plastic exposure than is good for us. If you’ve been trying to get plastic out of your life, these wonderful plastic alternatives will help! The environmental and health impacts of plastic is pretty huge. Producing it adds unhealthy compounds to our air and water, and the plastic in our oceans winds up in our food supply. Every year more than 8 million tons of plastic winds up in our oceans! Much of the rest of the of the nearly 350 million tons (!!) of plastic produced every year gets tossed in landfills or incinerated, where it adds chemicals to the water supply and to the air we breathe. It’s time to break up with plastic wherever we can, for the good of the planet as well as our own health. A 2014 study found over 6000 chemical compounds currently used in food packaging, 175 of which are “chemicals of concern,” meaning that scientific evidence has linked them to health problems like cancer or hormone disruption. There’s no safety data on many of the other compounds used in our food packaging. Plus little is understood about how much of these compounds wind up in our food. Best to play it safe and avoid plastic where you can. Plastic alternatives are widely available and may save you money on one-use wraps in the long run. Do you need some alternatives to plastic? 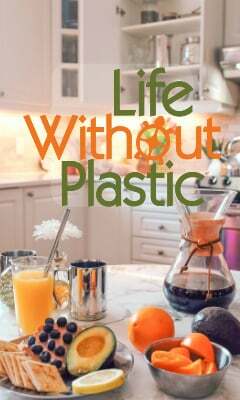 Look around your kitchen and you may be astonished at how much plastic you find. In addition to plastic storage, and maybe some plastic tableware, a bunch of your food probably comes in plastic. Cheese, nuts, cereals — so many healthy foods come in plastic it can be really hard to avoid. But there are some pretty straightforward ways to cut way back on plastic in the kitchen. Many of them help you get closer to zero waste and also save you money, like bringing your own jars to refill at the bulk bins. Take a good luck at what’s on offer in your local natural foods store’s bulk aisle. You will be amazed at how many options there are for waste-free shopping. I get pepitas, sunflower seeds, oatmeal, flour, nuts, coconut, yeast, herbs, and lots more pantry staples from my local co-op. I can even refill honey and peanut butter jars and reuse my egg cartons to cut down on packaging waste more. I also bring my own produce bags and choose unpackaged produce whenever possible. More people have raised objections to all the stupid waste of plastic in wrapping each cucumber in plastic, so hopefully we’ll see that obnoxious and wasteful trend start to reverse. If you have a choice, always pick the unwrapped produce! It often costs less. Sometimes it doesn’t, but I’m willing to pay more not to add to the waste problem with those horrible plastic boxes of lettuce and tomatoes. A simple set of mason jars is a good start to plastic-free shopping. You can also save jars from things you buy like jam and nut butters. For storage, the options made of glass and metal have exploded. I absolutely love these metal lunch boxes and storage containers. They’re incredibly durable and are easy to clean in the dishwasher, great if you hate washing dishes as much as I do! Note: This is NOT a sponsored post. I’m a huge fan of the research Pure Living Space has done to make it easy for all of us to choose the safest products. Read more about why I asked to become an affiliate in this post on how to choose a water filter. Bee’s Wrap replaces plastic wraps and bags. Made of beeswax, GOTS-certified organic cotton, and jojoba oil, these wraps can be used again and again and let you avoid exposure to plastic chemicals and produce less plastic waste. Plus, both beeswax and jojoba are naturally antimicrobial. Their sandwich bag even has a button to let you tie up your wrap, and then it becomes a placemat for your lunch! Wrap bread, cheese, vegetables, or use Bee’s Wrap cover a bowl. Bee’s Wrap is a sustainable, healthier alternative to plastic wrap. Bee’s Wrap lasts up to a year. To reuse it, just wash with soap and water. Pure Living Space also carries some super-useful reusable mesh produce bags, the perfect alternative to plastic grocery store bags! Each bag can save over 1000 plastic bags. These reusable bags also work for bulk purchases like nuts. You can even use them for making your own nut milk. Yum! You can wash these bags by hand and hang to dry or use your washing machine and hang dry. Celebrate Earth Day with smart swaps like plastic alternatives for a greener, healthier home! The plastic alternatives raffle is over. Congratulations to Trudy of Cottonwood, AZ! Hope you enjoy your new green plastic alternatives! Pin to save this information on plastic alternatives! « Free Plants for Your Garden! Glad to find your blog. Thanks for sharing useful information!